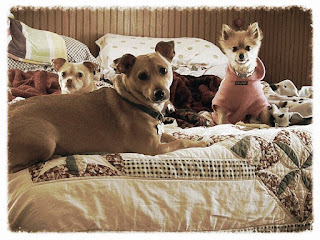 Our Bodacious Dog Mom Life: We're Not Fans Of The Term "Foster Failure"
We're Not Fans Of The Term "Foster Failure"
Two weeks into fostering Lobo, we made the decision to adopt him. When we made the announcement, and the news spread, that's when it started. The infamous term "foster failure" was thrown at us. While this term is used in good humor and common jargon among the rescue community, we don't much care for it. To begin with, I don't like the word failure. It's a negative word and represents a lack of success. Our decision to adopt Lobo, and eventually Sophie (whom we had fostered for almost a year), in no way, shape or form, represents failure. If you're not familiar with the good-humor term foster failure, it's applied to those who foster animals and, during the fostering period, they adopt the animal they're fostering. While this is a happy ending for the animal and there are lots of cheers and happiness when this happens, this is the point when you'll hear, "You're a foster failure." When you foster an animal, you form a bond. There is a level of attachment. You're part of the journey. Fostering is the middle ground between rescue and adoption. Animals need foster homes for various reasons including recovery, training, socialization, adapting to a home environment, etc. This could take a week or months. Every case is unique. While fostering, you provide the care, love, affection, transport, etc. Medical costs and supplies are covered by local shelters or rescue groups. That all depends who you're fostering for. 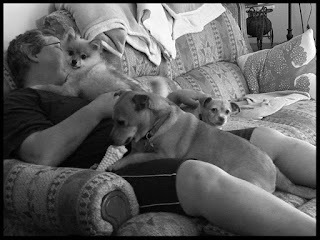 Lisa and I foster on occasion for our local animal shelters. A lot of people don't foster because of the emotional attachment formed with the foster animals. I understand this completely. I've shed tears after bringing foster kittens back to the shelter when they've reached 8 weeks old and are ready to be adopted out. Or, the semi-feral kittens we've fostered so they could get acclimated to home life. They grow on you. I'm not going to lie. It's hard. However, despite all, there are some occasions where it goes beyond emotional attachment. It was simply meant to be. The universe did a little shimmy shake. Fate stepped in. That was the case with both Sophie and Lobo. Once upon a time, Coco was our only child. We kept it that way for about 2 years. We honestly thought he wouldn't do well with a sibling. Then, during a biscuit love run to one of our favorite locations, there she was. The universe didn't shift on our first visit. It was the second visit. While in the office at the animal shelter, the ACO let Sophie in. We were happy to see that little nugget o' love again. She gobbled her biscuit love with gusto. Then, Lisa picked her up. Sophie mashed herself against Lisa's face. They both looked at me. I knew it was coming. Despite a stream of reasons why this would not be a good idea waiting to burst from my mouth, I inhaled and said, "We'll try it." Two days later we knew. She had chosen us. It took almost 2 weeks to fully integrate Coco and Sophie, but it happened. They've been inseparable since. Lobo was a foster as well. He arrived her in January of 2015 the day after having his hind leg amputated. You can catch up on his story here. Lobo needed 'round the clock care. I work at home and I'm up on the overnight. Caring for him 'round the clock would not be an issue. Lisa took over when she arrived home from work while I napped. 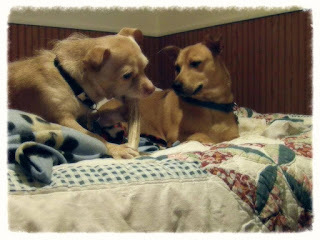 We were certain Coco and Sophie would have a difficult time adjusting to a foster pup. We kept Lobo gated in the office. The office is off of the living room. He was always within eyesight and one of us was almost always in the office. All that separated the 3 kids was the gate. There was no barking or growling. They sniffed. Sophie whined. Coco perched himself on the gate. Lobo sat there, curious. While we were tempted to lift the gate, that wasn't going to happen until Lobo's sutures were out. Until then, Lisa and I sat on the sofa with all 3 kids. They sniffed, found a spot to curl up in and that was that. Lisa and I were speechless. Shortly after Lobo's appointment at the veterinary hospital to have his sutures removed, it happened. I was the first to break the silence. It was more like, "Who was going to say it first...."
There was an inexplicable bond that formed not only with us, but with our kids. We couldn't explain it. All we knew is that Lobo was meant to be a part of our family. The universe had shifted. Fate stepped in. We did the tango. We knew our life would change drastically with a special needs kid. Not only did he have only one hind leg, his remaining hind leg had, at one point in time, sustained an injury. Limited mobility. We'd possibly have to build steps or ramps, carry him up and down the stairs, purchase a pet stroller and carrier, etc. After almost a year, all of the above are necessary must-haves despite strength training. After many tears, the walls of stubbornness crumbling down, we made the we-want-to-adopt-Lobo call. More tears. Happy tears. Then, a couple of days later, the well-meaning comments revolving around Lisa and I being foster failures started. Humans who are deemed foster failures aren't flawed. They don't adopt their foster animals because they have issues with letting go. Sometimes, it's just meant to be and it's difficult to explain what happens when that happens. Did we fail? Nope. A happy ending has nothing to do with failure.